Dry Skin in the Winters bothering you? Here’s how you should deal with it! Winter has set in, and so have the woes for your skin! Dry itchy skin is one of the most common things that one experiences during the winters. Why does the skin get dry and itchy during winters? When the temperature drops, the clear, cold days of winter can dry out skin’s natural barrier, creating dry, itchy, and irritated skin. 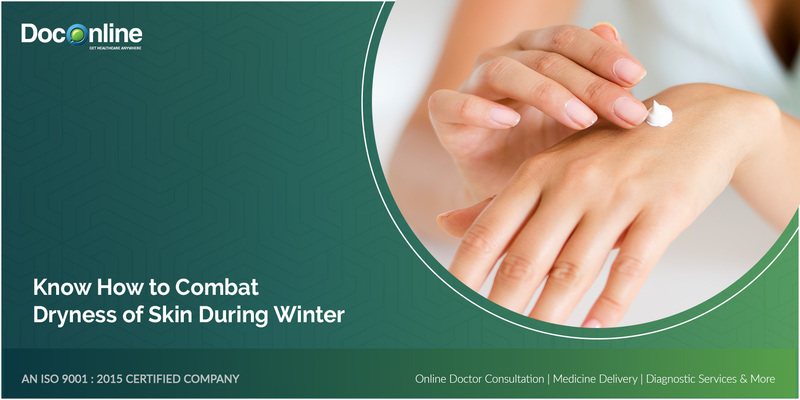 In addition to the different winter illnesses that one may experience, for some people the dryness is so severe that the skin becomes cracked and inflamed. These conditions can also worsen the symptoms of eczema. As the winds pick up and the air dries out, our skin’s moisture levels plummets just like the temperature outside. Moreover, all the steps we take to stay warm end up harming our skin even more! The dry heat pumping inside our homes and those long, hot showers we like to take certainly are not doing our skin any favors. Are you suffering from dry itchy skin? You're not alone. No matter what our age, most of us experience flaky, itchy skin at some point when the weather gets chilly. The culprits may be winter wind, dry indoor air, harsh soaps, low humidity, or even a cold-weather sunburn. By taking extra care to keep your skin moisturized, you can avoid chapping, itchiness, and cracking of the skin. How to diagnose dry itchy skin? If you have dry skin, you may notice your skin to lack luster, not shiny or looking dull. It may also develop small lines or cracks in it. It feels rough and dry to touch the skin and looks as though the scaly flakes will fall off in tiny bits. While any part of the body can be affected, dry skin is particularly common on the shins and the arms. Avoid soaps - chemicals in the soaps are harsh on skin, and they tend to strip the skin of its natural oils. So, during winter, use gentle cleansers and avoid washing face again and again. Avoid hot showers - Hot water also cleanses the body and along with it washes away the body oils. It leaves the skin dry. Try to take small showers with cold water. Apply moisturizers - Depending on the skin type, one can apply moisturizers, ointment or lotions. For heavily dry skin, apply body butter or vaseline (petroleum jelly) as it locks the moisture inside. Apply moisturizer every time you are to step out of the house. Do so immediately after shower and also before sleeping. Avoid exposure to dry air - Each time you go outside, apply lip balm. Cover the exposed parts of your body with gloves and scarfs. Don’t wear thermals directly as their contact with the skin can cause sensitivity issues. Instead, put a loose cotton cloth before that to avoid direct contact with skin. Apply sun screen even during the winters. Avoid bare-body exposure to air post swimming - After swimming, take a quick shower and apply moisturizers. Exposure of the bare body to the winter air after swimming, brings dryness to the skin especially due to the sensitivity to chlorine. Apply Coconut Oil - Applying coconut oil on dry skin really helps. Coconut oil is a good emollient. It locks the skin moisture and makes it smooth by occupying the spaces between the cells. Hydration - Drink plenty of water as it keeps the skin hydrated. Avoid frequent moistening of your lip. This is because when the saliva dries, it leaves the lips drier. Oat meal bath - Putting powdered oatmeal in the tub before bath is a good anti itching agent. It is a good colloid which is an antioxidant and soothing agent. Antioxidants - Eating foods which are rich in antioxidants like tomatoes, lentils, carrots and beans help prevent the damage due to toxins. Honey - Honey is anti-inflammatory, healing and moisturizing in nature. Applying it directly to the skin keeps it from drying. Aloe Vera gel - It relieves the dryness and protects the skin. Applying cucumber juice and yoghurt also prevents dry skin. The doctor may assess the skin and may also advise some topical agent or steroid to bring relief. So, should you find your skin drying, simply ask a doctor online and get the correct advice. With these simple tips, get ready to beat the chills and enjoy a happy winter!